What kind of awesome game are you working on? We’ve just wrapped with the production of our first big strategy and skill based game called Orbit’s Odyssey. 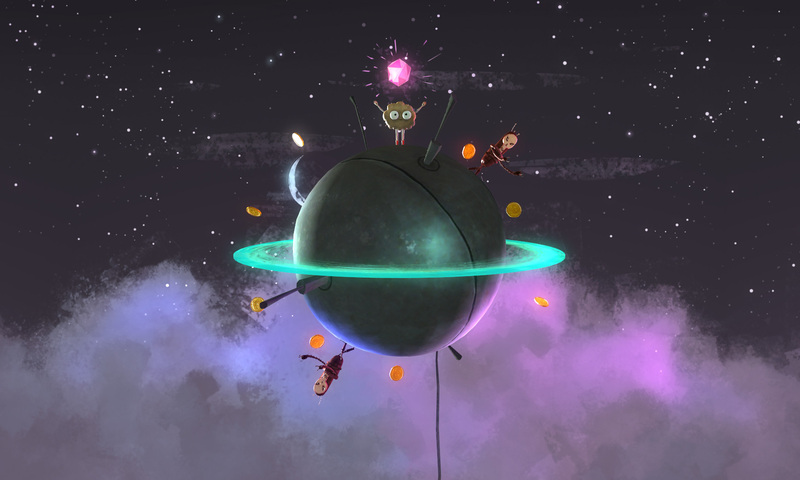 The game is about a humanoid cookie – escaping from the robots in search for his space-boy alter ego – Orbit. The player travels through varied worlds/planets leading the hero to collect coins & gems and dodging robots/monsters. We think the game is super unique both from a gameplay as well as a graphics perspectives. Each level can be tackled in different ways! The player has to adopt the best strategy in each level to achieve game objectives efficiently. The levels get progressively difficult with an increasing number of enemies, and the quick changes in speed and direction of each planet. The artwork is amazing, how did you come up with it? We roped in Bryan Lashelle, as the art director. For the look we were heavily influenced by old sci-fi pop art, movies, and early space exploration. We wanted to incorporate backgrounds that felt like there was dimension and depth to them. This made the game more of an immersive experience, and not just an action puzzler. Not sure if this is a feature per se, but we firmly believe the game’s uniqueness quotient is particularly high – the players would be amazed to note how a simple one-touch control can yield different outcomes – in terms of the speed, roll direction, teleportation and the hero’s placement on planets. This needs to be experienced to comprehend more on the game! paperkyte as a company is a startup and is the sister company to SF based animation services company Aatma. We focus on giving audiences something novel/never experienced before with next level casual mobile games. (Please note, we launched a test game late last year to understand the mobile game ecosystem – we will take it off the app store before the launch of OO, as we feel the first game doesn’t fully reflect our capabilities). Why did you start paperkyte? With a rapidly exploding mobile game market, and a race to the bottom (in terms of the quality) from a plethora of apps available, we at paperkyte saw a distinct opportunity to make a difference. Having competencies in the craft of animation, via our sister Aatma, we wanted to bring the same level of quality to games, that Aatma brings to brands and agencies with content production. We hope to be a leading game maker in the long term, and expand to virtual reality games, while simultaneously pumping out high quality games for mobile.